Momma Told Me: Never stop exploring. 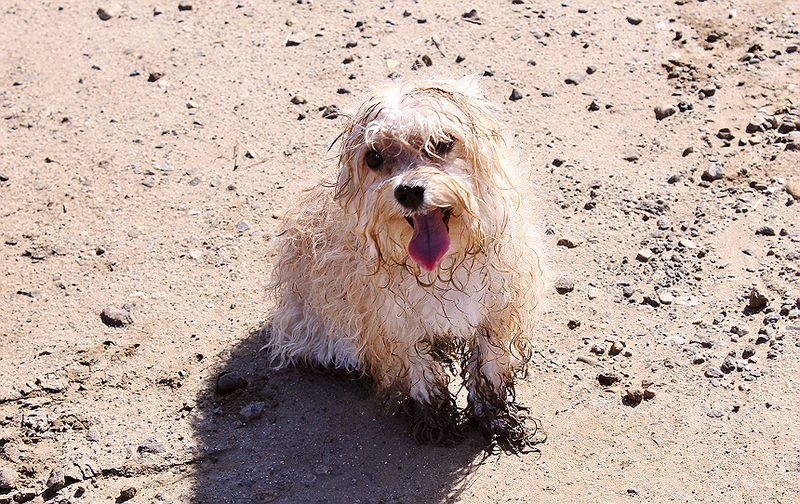 Some may think that Nora, weighing in at 7.8lbs soaking wet, and standing a whopping 13" tall is not much of a dog. Small breed dogs have a bad rep for sleeping in all day, being carried, and getting dressed up for their owner's entertainment. But the truth is, it doesn't matter the size of the dog- Man's Best Friend is precisely such for their unending curiosity and thirst for exploration, unmatched loyalty, and energetic companionship. Of course there are traits that vary with the breed of dog, but every dog is a canine underneath. For our family, and Nora, that means plenty of exploration and a thirst for life that truly inspires the humans around her. Nora has many nicknames 'Rocket Dog,' 'Wildling,' and 'The Flash' are just a few. We like to take a short drive from our home and let her run wild in the abandoned fields by the high school. It's great to get her off a 'leash' and really let her connect with her roots. Freedom is something Nora enjoys almost as much as a good run. For someone who's legs are 5" long, she can outrun me until she's just a speck on the horizon! As much as I love sending Nora to the 'dog spa' to get a trim, and general pampering- Nora has other ideas of indulging herself. It drives my father bonkers how little we restrain our pup, and the lack of 'training' we gave her. Nora likes to play rough, and puts all of her enthusiasm into it, with the kindest heart, of course. I snapped the above shots when we took her on a 'fashion' photoshoot I was doing for the blog. Behind us were beautiful strawberry fields and a rustic old barn. Nora spent her time waiting on us chasing after birds and mice through the mud- I think it's safe to say she might have even had a romp through the sprinklers. Doesn't that face just sum up everything great about having a dog in the family? As curious and energetic as Nora is we are constantly planning day trips just for her to go out, get back to her roots, and explore her wild side. 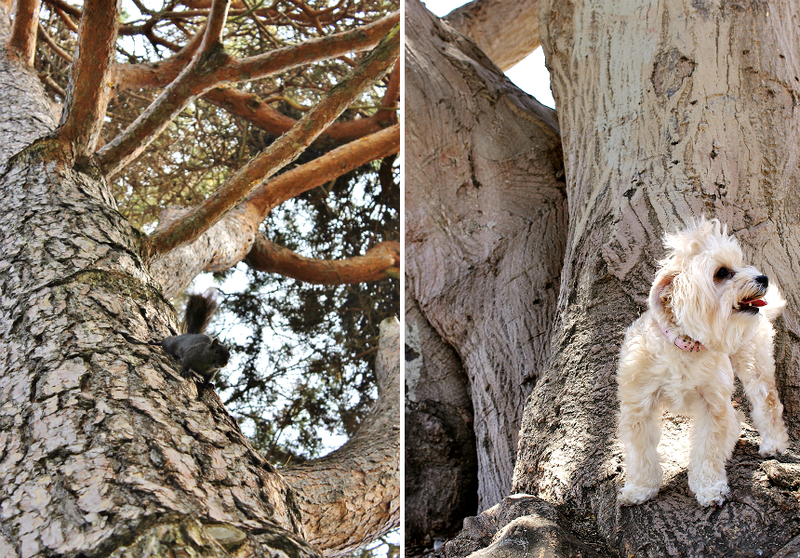 She loves a good adventure, and she loves interacting with other animals and wildlife. 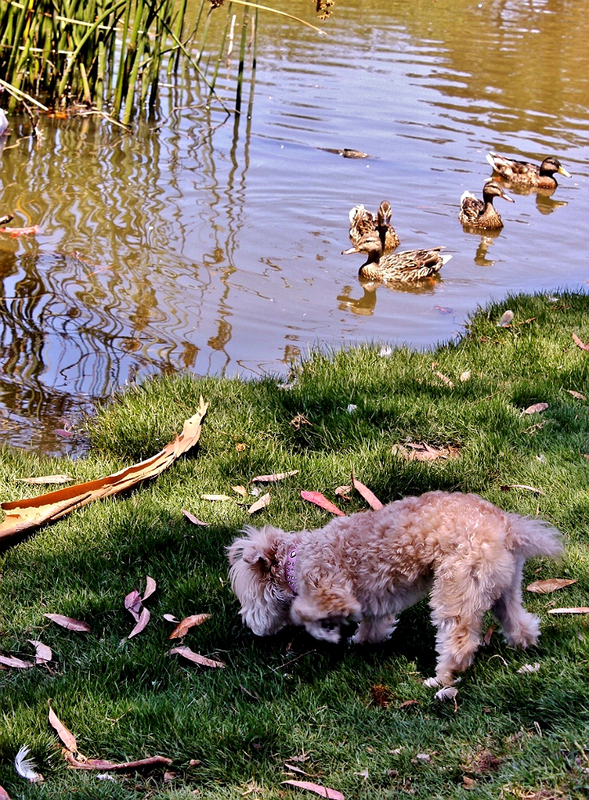 The nearby pond is a favorite where we can spot squirrels, turtles, seagulls, ducks, and even a swan or two. On our first trip I was worried her enthusiasm might wind her up in a hot water with the territorial birds. But size means nothing to Nora- she happily told them she was here to explore, and they could just leave if they had a problem with it. On our more recent trips Nora's turned into a tracking dog. She likes to 'point' and sniff things with great intent, following invisible trails down the shore until she runs face to face with an ornery duck. An argument inevitably ensues until she spots a squirrel or some other wildlife in need of due inspection. Nora never seems to tire- as long as there is a field to be ran through (even in circles at times) or a new corner of the park to explore she'll keep going. Sometimes she explores with such enthusiasm we have to literally run to keep up and force her to stop and hydrate! The fact that she's leaping over mountains of grass with her tongue smacking her neck doesn't seem to bother her one bit. 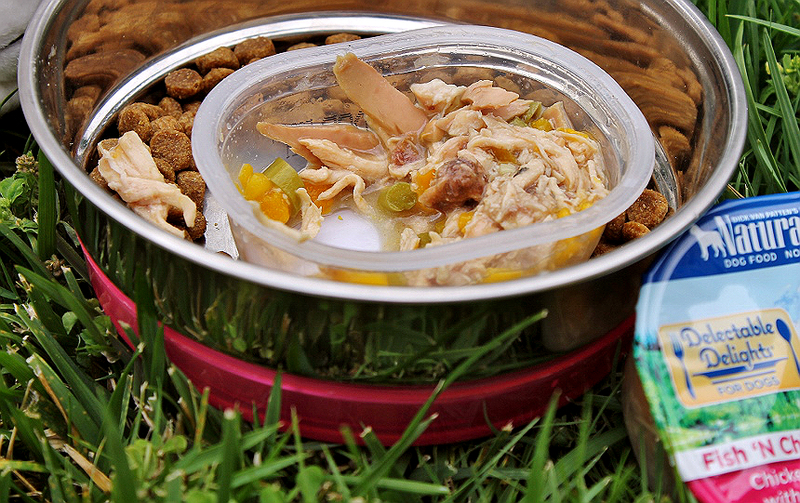 Of course a high energy dog requires delicious food and great nutrition. 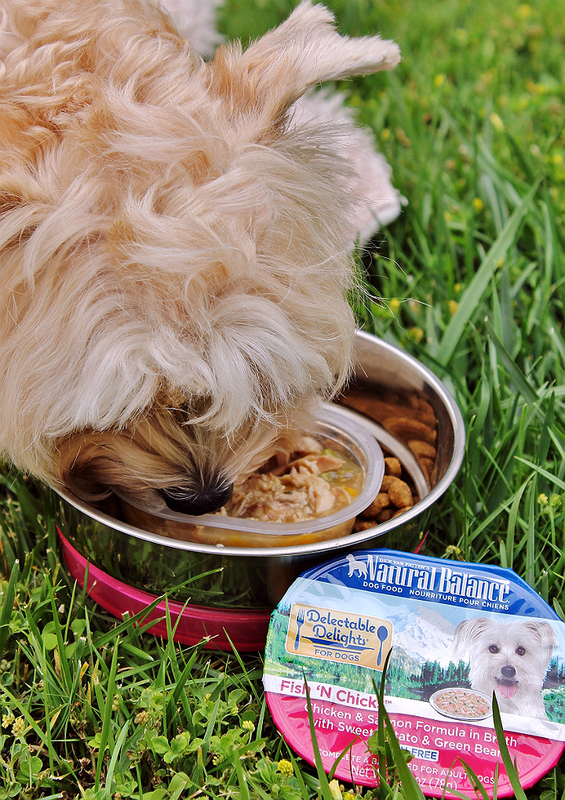 We feed Nora Natural Balance Wild Pursuit Dry food and Natural Balance Delectable Delights® single serve wet food cups. It's a brand we trust for Nora because each of it's unique pet food ranges are formulated based on scientific principles of a canine's dietary needs. 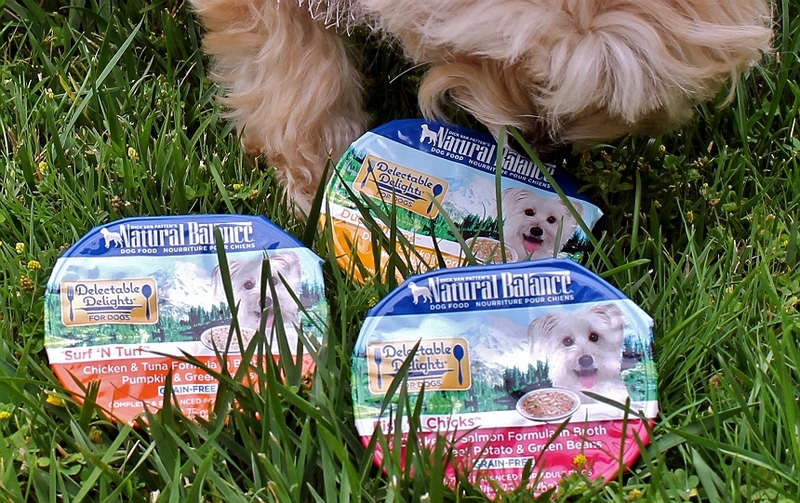 Delectable Delights® single serve cups come in 4 delicious grain free flavors, Woof’erole™, Surf N' Turf™, Duck'en-itas™, and Fish N' Chicks™. Each single serve cup is the perfect size for a small breed dog, or a great supplement to any larger breed's everyday meal schedule. These unique recipes feature real chunks of protein and wholesome ingredients cooked in a savory broth that will turn any bowl of boring kibble into a real 'fuel' treat! Best of all, these are easy to toss in our 'go bag'- so we always have some on hand when we get caught at the park on an extra long exploration session. 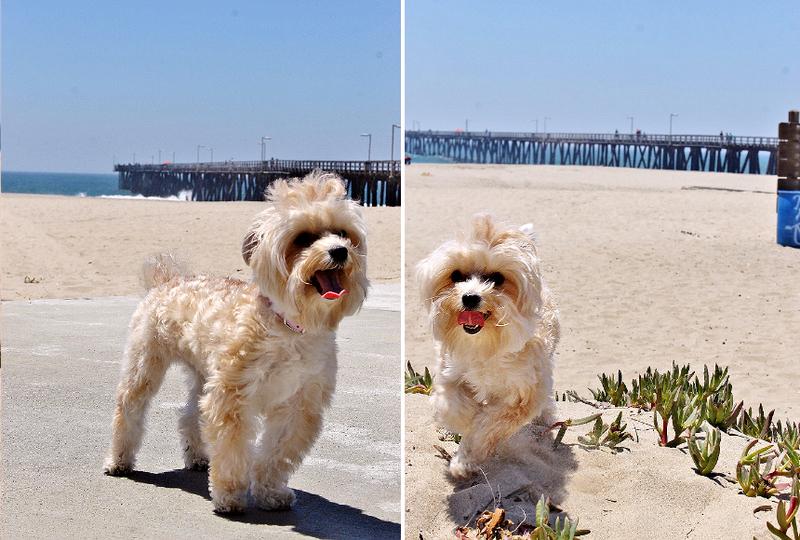 Believe it or not the beach is actually much closer than our favorite park, so we take a walk to the pier whenever we can. 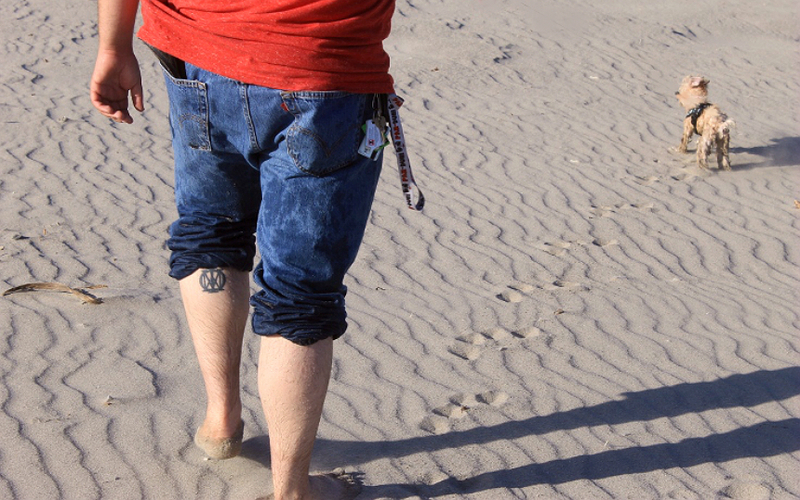 I like to go during the week, when it's usually less crowded, and really let Nora go wild in the sandy dunes. There is something about sitting on top of the dunes and barking at all of the seagulls that entertains her endlessly while I attempt to catch some sun! One might think Nora would have a hard time carving through the sand up and down the inland shore, but she is actually much more nimble than me. She certainly doesn't sink as much! 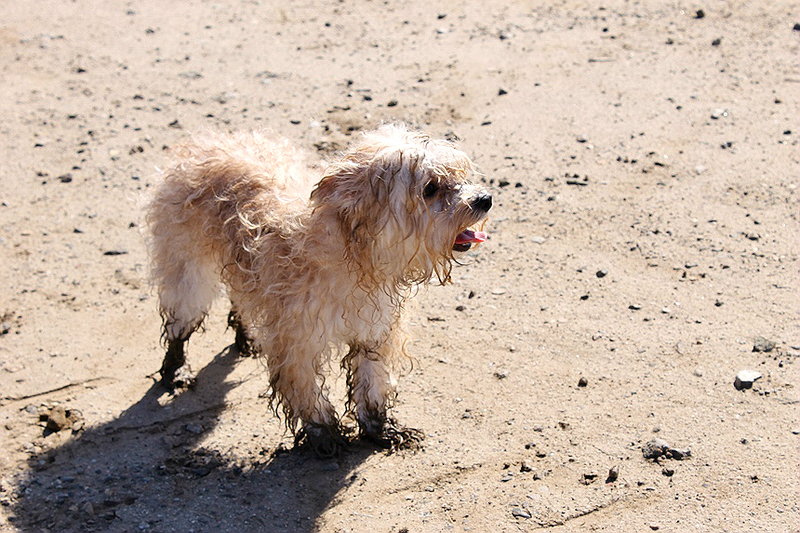 Sometimes, if it's windy I can hardly see her through the sand being kicked up with each leap! 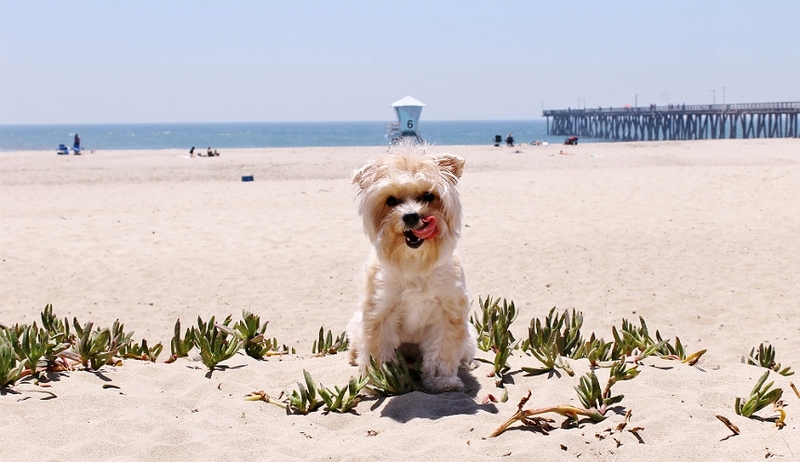 When it gets especially hot out she'll roll in seaweed or the plants up by the dunes to help cool off. 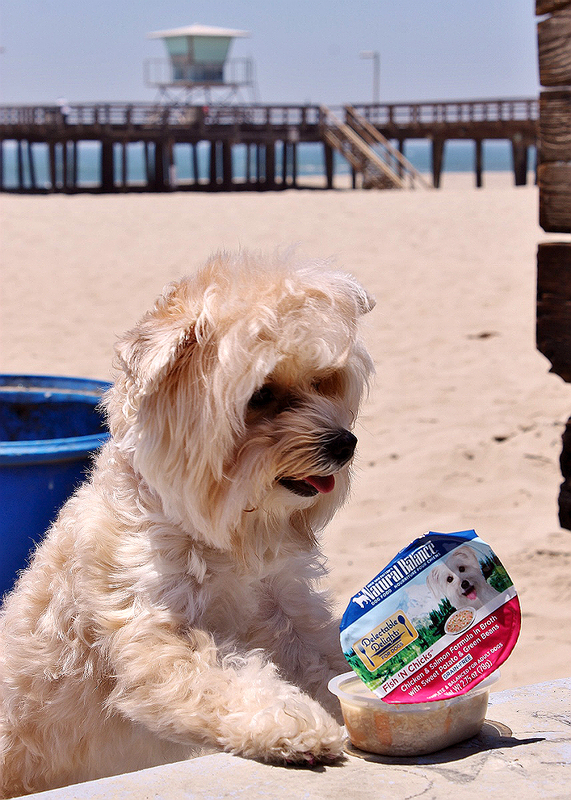 We bring our Delectable Delights® with us to the beach too, I like to think I'm being witty when I pick up a few extra packs of Fish N' Chicks™ just for beach days. With real chunks of chicken and salmon alongside sweet potato and green beans in a rich broth, I actually find myself getting a little jealous of the gourmet eats. I hate to say it- but I always remember to bring a snack for Nora, I rarely remember to pack one for me! Whenever we sit down at the cookout tables she's quick to jump up onto the concrete seat and begin scanning the table. Nora's no fool- she knows we only go to the tables for one thing- to eat! Momma Told Me not to swim on an empty stomach- so we like to go sunbathe a little more after snack time. I like to think of this as the time when Nora 'scouts' her next attack- eyes a particular seagull, or barks at a family passing by. Every now and then, when she can get the attention, she'll even wander off (with my permission) and play fetch with some locals near by. 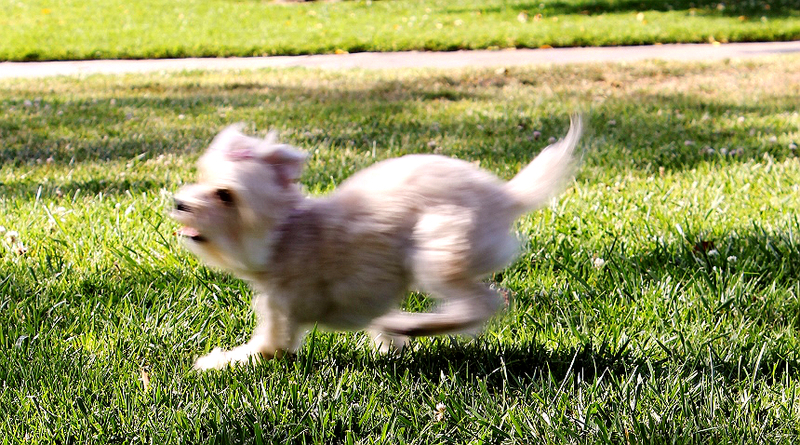 She even tries to play Frisbee and catches some amazing air! 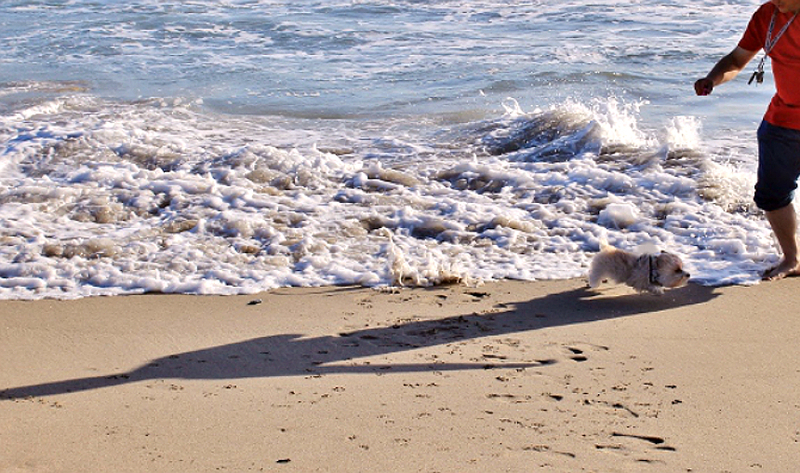 Trips to the beach almost always end with a walk along the water- Much like the pond, Nora will follow her nose right up to the water's edge, only to realize seconds later the tide is rolling in much faster than her paws can get traction in the wet sand! (Don't worry we never leave her alone at water's edge without supervision and a flotation vest.) After a few waves she starts daring the tide to roll in, and will even run up as it recedes back into the shore and bark as if she's scaring it away. By the time we're ready to pack it in Nora's a wet, sandy, wind blown dog- still bouncing up the sand dunes with her tongue hanging out of the side of her mouth. 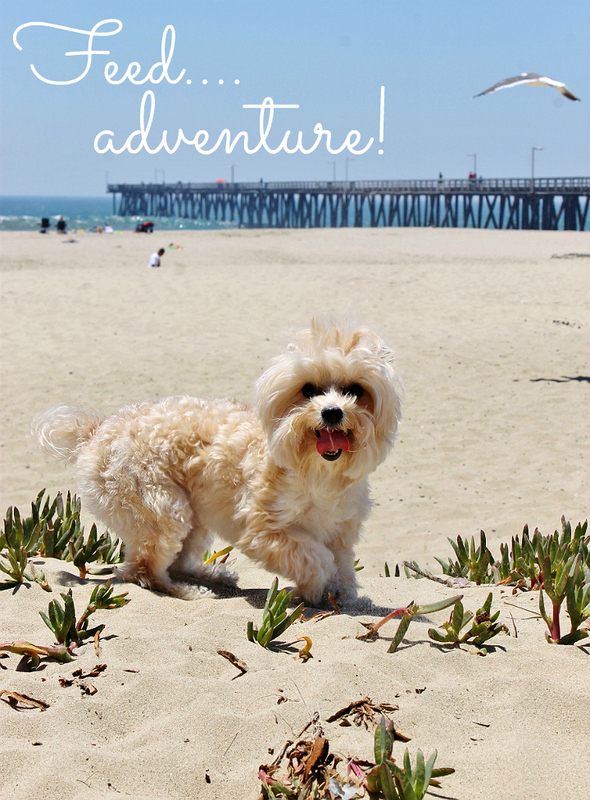 How do you explore with your dog? Follow Natural Balance on Facebook and Instagram for more paw-some pet adventures, and keep an eye out for Delectable Delights® at a store near you. What Daughter Says: Nora inspires me to always explore and greet each day with unbridled enthusiasm. What an adorable pup, and the delectable dog food sounds like it would be an ideal food choice. What a sweetie pie! I seriously just want to reach through those pictures and snuggle her! 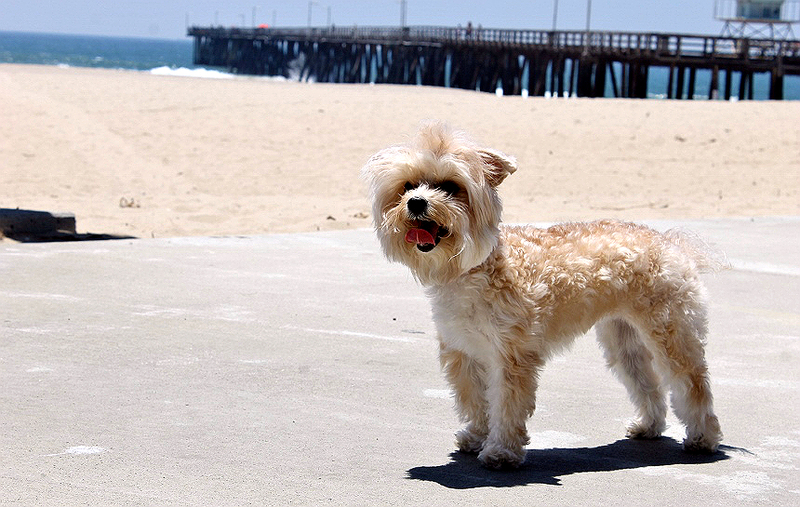 Sounds like she's quite the feisty pup too regardless of her small stature. Finding a food that compliments your animal and helps them be the best they can be is so very important. I swear you should be a photographer and NORA should be a model. The photos you get. It's so obvious that she loves Delectable Delights®, her enthusiasm in undeniable!